Generally speaking, Syncios detects your Android device automatically when your device is connected to the computer. 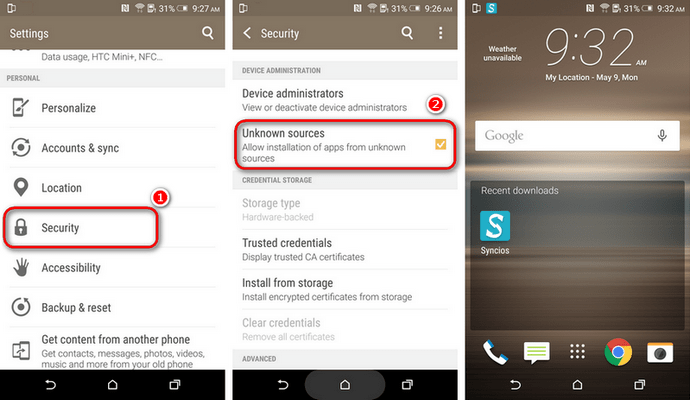 But if your device is not detected normally, what should you do? First of all, please make sure your are running our latest Syncios Manager. Occasion 2: Failed to install Syncios Apk on your phone. Occasion 6: Syncios can not recognize my Android 2.x device. 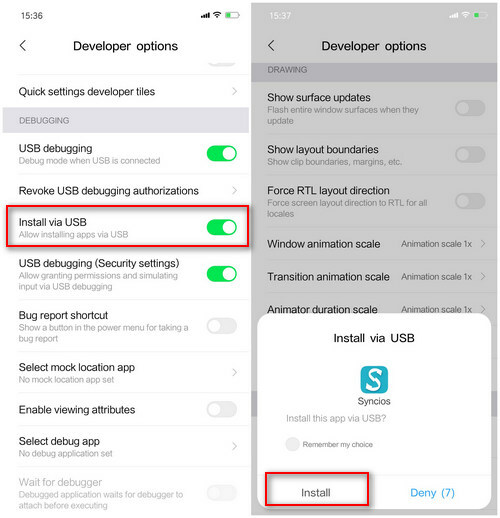 + How to Enable USB Debugging Mode on Samsung? 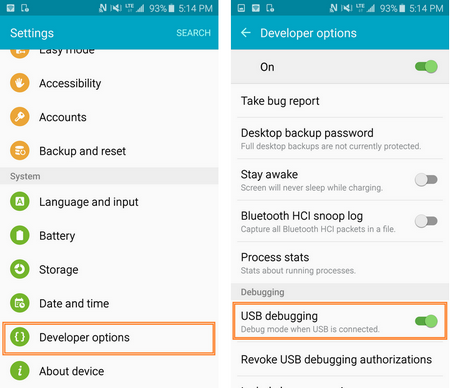 +How to Enable USB Debugging Mode on Huawei/Honor? +How to Enable USB Debugging Mode on Xiaomi/Redmi? +How to Enable USB Debugging Mode on Alcatel/ASUS ZenFone/Meizu/Nokia? +How to Enable USB Debugging Mode on Google/Gionee/HTC/Lenovo/LG? Step 1 Go to Settings > Networks, find tethering & networks under "Connectivity". Step 2 Click "tethering & networks", enable the "USB tethering" option. +How to Enable USB Debugging Mode on Motorola/OnePlus/OPPO/Vivo? 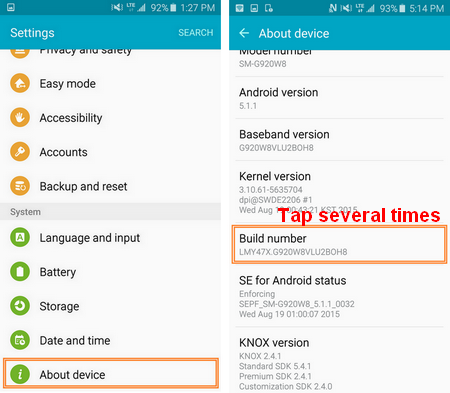 +How to Enable USB Debugging Mode on Sony Xperia/ZTE/Nubia? 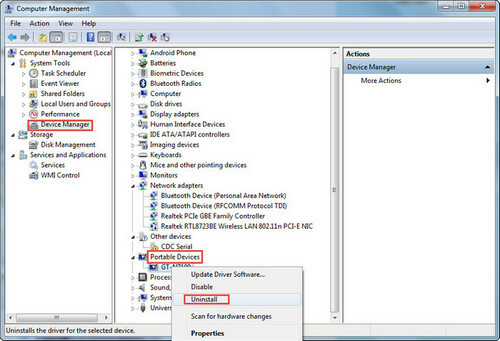 +How to Enable USB Debugging on Android 4.2 - 6.0? Step 1 Unlock your Android phone and go to Settings. Step 2 Under Settings, scroll down and open About Phone. Step 3 Find Build Number and tap Several times until you see a notification that says “Developer mode has been enabled“. Now you have successfully enabled developer option on your Android smartphone. Step 4 Go back to Settings, Scroll down and tap on Developer option. Step 5 Under developer option, tap on USB debugging, select USB Debugging to enable it. Note: If you are in Android 4.1 or earlier version, please go here to learn more. For Android device users, in order to successfully transfer or backup data from Android, you must have the Syncios.apk installed on your device. Otherwise, Syncios program would not recognize or detect your device correctly. Check your phone screen, there will be an install prompt when you connect your phone to Syncios. If there was no such prompt, then follow the steps below or download and install it on your device manually. Step 1 On your device, navigate to Setting > Security. Step 2 Scroll down and check Unknown sources to allow installation of apps from Syncios. Step 3 Connect your device with PC and launch Syncios program, the Syncios.apk will be installed automatically. Step 4 For Android 8.0+ users, please make sure you have enabled "Install via USB" option under Developer options. Step 5 Keep your device unlocked when connected to Syncios, there will be a pop-up windows, allow to install Syncios android app via USB. If still failes to detect, please check wether your phone is in "Charge only" mode. Simply tap and drag down the Status bar, tap Connected as a media device or Connected as a camera. In the USB computer connection setting, switch the followings USB connection mode. Media device (MTP), Camera (PTP). For Android 8.0 users, you need to choose Transfer files. When you connect your Android device to windows computer, it will automatically download Mobile ADB driver on your computer. You can see "Installing driver..." message. If it shows "Installation failed", then you can go to here to download a certain one for your smartphone. Before the re-installation, please right click My Computer > Manage > Device Manager > Portable Devices to remove the old driver. If your device firmware is 4.2 or later, please check your phone screen and authorize this computer. If you do not find authorization prompt on your device, please re-plug the device to have a try. The latest Syncios mobile app no longer supports Android 2.x devices. 1. How to fix the "Entry Point Not Found" Error? 2. How to fix the iOS detection problem? 3. What to do if Syncios failed to recoginze my SD card?